There are some sights that really bring home to me that autumn has arrived and winter can’t be far behind it – and one of those is seeing the huge flocks of rooks that wheel in acrobatic formations over the Thames mornings and evenings. Reader Nigel Brecknell snapped this photo of hundreds of rooks flying over his house near Penton Hook Lock – but where are they heading for? And one of my regular correspondents, Nigel Brecknell who lives at Thames Side near Penton Hook Lock is equally fascinated by this amazing spectacle. 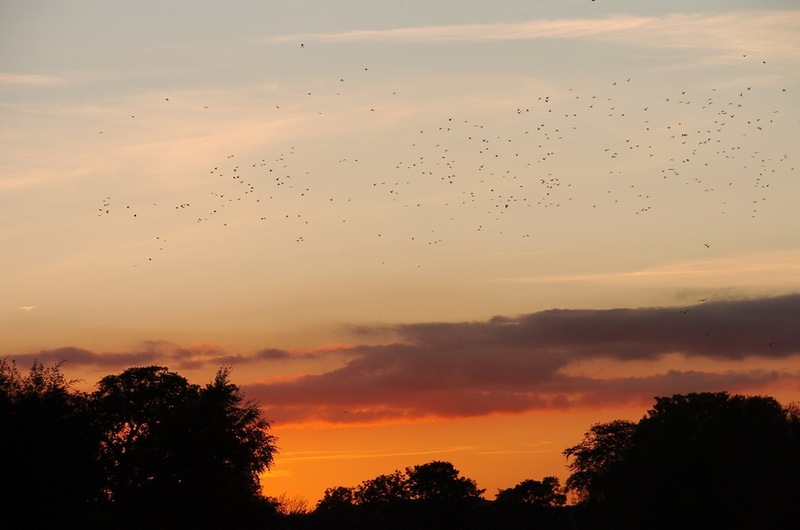 He said: “Hundreds, if not thousands, of rooks fly over my house at sunset from September through till March. They come from the direction of Silvery Sands and fly down the reach towards Penton Hook Lock before heading off apparently in the direction of Chertsey. Nigel tells me that the route taken by the birds is very constant – not more than 200 yards either side of the river. Sometimes they’re quite high (as in the sunset picture he’s provided here) but sometimes in huge swarms at tree top level over his cottage. Certainly, I’ve witnessed similar flocks close to the River Ash up by Queen Mary Reservoir and the noise they make can be almost deafening at times. But when they decide to roost in the trees that ring the reservoir, it’s amazing how quickly they fall silent. If anyone can help answer Nigel’s question about where the flocks that pass his house every evening do eventually turn in for the night, do please let me know. DELIGHT abounds in the Smith household at the moment because our old Seamaster Admiral cabin cruiser, Terra Nova, has just passed her boat safety certificate inspection. Not that she did it with flying colours, mind – our inspector, Paul Killick, pointed to a number of minor things we needed to address – but the bottom line is that she’s been given the all clear to keep us on the water for another four years, which is excellent news. The boat safety inspection is a bit like an MOT for boats – but it concentrates on ensuring that when you go out on the river, your boat is as safe as it can possibly be. They inspect the fuel delivery systems, fire fighting equipment, the electrics and, probably most importantly, the gas system if you have a cooker or heater aboard. And believe me, I’ve witnessed at first hand the devastating effects of a gas explosion aboard a boat so it’s a check worth having. Anyway with that good news, we can start planning for more Thames expeditions when the spring arrives.